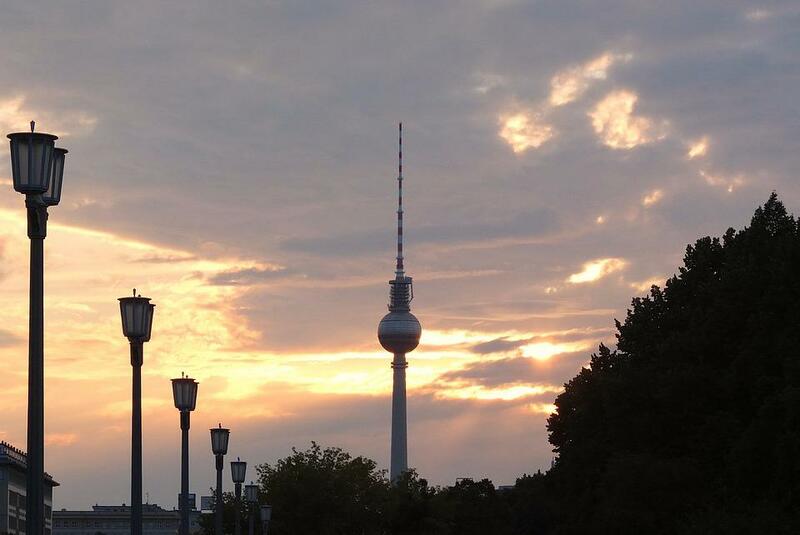 The 224,000 streetlights have a special significance in Berlin. The German capital has dozens of different types, most of them suited to their environment. They tell the history of the city, of the tastes of emperors and politicians, technical progress and war times. They carry names like Großer Galgen (big gallows), Schinkelleuchte (Schinkel lights) and Berliner Lanternen. Allow us to take you on a tour through the darkness of Berlin. An excellent place to start is our beloved Karl-Marx-Allee, because the streetlights are entirely in style with the rest of the GDR architecture. Even the lampposts were designed by an architect, namely Richard Paulick – which explains the name Paulick-Kandelaber (Paulick-candalabrum). There are an impressive 215 of them, and you wouldn’t be able to tell how tall they really are until you’ll stay right in front of one in the city museum Märkisches Museum. The top alone is about the height of an average person, and together with the pole they measure an impressive 9 metres. Just like the rest of the street, they are modelled after designs common in Moscow. No expense was spared; the story goes there is even porcelain in the lamp posts. Sadly, the GDR lacked the funds to maintain the streetlights and after the fall of the Berlin Wall, the lamps were in a horrible condition. Broken lights, torn concrete and even completely destroyed lamp posts was all that was left of them. Time for a renovation, but the city didn’t have the funds. “The most expensive lamps in Berlin”, a newspaper called them in 2007. Even after deciding to use cheaper materials, the costs were about 7 million euro. So the lampposts on the Karl-Marx-Allee are still channelling the fifties, and will hopefully always do so. But there’s more historic lighting to be found in Berlin. Districts like Charlottenburg, Schöneberg and Spandau are beautiful by day, but maybe even more so by night. Here’s why: gaslights. Once, there were millions of them all over the world and now electric lighting has replaced almost all of them – but not in Berlin. More than 50% of all the remaining gas lanterns in the world are in Berlin and 31,500 of the 224,000 streetlights in Berlin still work with gas. Quite amazing, isn’t it? Gas lanterns have survived everything that has happened in Berlin over the past 100 to 200 years. Right now, Berliners can’t imagine their city without the gas lanterns. Because the lanterns are a pretty sight and gas creates a different kind of light, warmer and less bright. 2,850 streets and squares in Berlin, often the most attractive historical streets anyway, turn into atmospheric, picture-postcard locations as soon as night falls. Berliners love their gaslights so much that there’s even a small open air museum dedicated entirely to these streetlights. It was opened in 1978, when electric lighting was taking over the city more and more. It currently has a collection of 90 different gas lanterns from Berlin and the rest of the world. Sounds like something the city of Berlin should be proud of, but even now the gas lanterns are under constant threat. As critics keep pointing out, electric lighting is cheaper, less damaging to the environment and makes the city safer, since gaslight is beautiful but doesn’t spread a lot of light. The association Gaslicht-Kultur disagrees and fights to preserve gaslight in Berlin, with many arguments pro gas lanterns and against electric lighting. Still not convinced? Take a free tour with them, by bike or in a bus, and you’ll understand instantly what they’re fighting for. So what about this visible East-West division from the sky? Is that because there’s more electric lighting in the East and more gas light in the West? Not entirely. Apparently there was also a difference between electric lighting in East and West Berlin: the East used yellowish lamps based on sodium, whereas the West used whiter, quicksilver-based lamps. Right now, more than 25 years after reunification, the lamps are still not united. So here we are, with gas lanterns in the West and yellowish lamps in the impressive lampposts on Karl-Marx-Allee.